Prevent misuse that can lead to drug addiction. Sixty-seven percent of people who misuse prescription medications get them from friends and family and only 5 percent of children who misuse prescription medications say they get them from a stranger, a drug dealer or the internet. 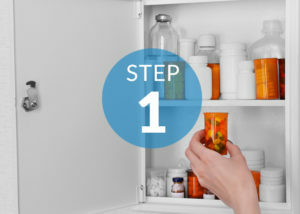 Securing your medication in your home and properly disposing of leftover medications can keep them from being misused. Further safeguard your medications by monitoring the quantities through frequent checks to see if anything is missing. Medication lockboxes and locking pill bottles are readily available at pharmacies and online vendors. The safest and most environmentally responsible way to keep leftover medications from being misused is to take them to a secure take-back location. These are often in pharmacies and law enforcement buildings. Some communities will also hold occasional “take-back” events. Alliance has compiled an interactive map featuring safe disposal sites reported by a variety of reputable sources. Note that this map may not be comprehensive. If you cannot get to a drop-off site, there are home disposal options for unneeded medications. Several products exist that can deactivate drugs and make them safe to dispose of with household trash. We have a limited supply of DisposeRx drug disposal packets available for distribution. How does a disposal packet work? DisposeRx packets are easy to use and highly effective. Simply add warm water to the pill vial, add the DisposeRx powder, and shake. The contents solidify within 10 minutes. Then simply discard the vial in the trash. Learn more about disposing of leftover medications with DisposeRx. Watch a video on how to use DisposeRx packets.